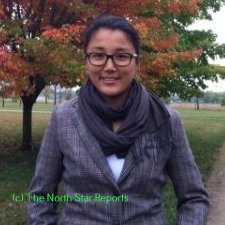 Hello everyone, I’m Ngawang Gonsar, serving as a North Star Reports (NSR) senior Editor. I was born to Tibetan parents in India and spent most of my formative years at a little boarding school in the foothills of the Himalayas. After the completion of my K-12 education in India, I traveled across the globe to pursue my undergraduate degree at CSS in the fall of 2006. At CSS, I’ve been able to pursue the breadth of education spanning the liberal arts curriculum. I hope that with the changing landscape of higher education, my younger colleagues who are yet to complete their undergraduate degrees, will have the same opportunity. Since then, I’ve gone on to complete my Masters of Science with a focus on Developmental Biology from the University of Minnesota. I’m currently a Biology Instructor at Gustavus Adolphus and have been for almost three years. I hope that in the near future I get to continue to travel and learn more of the personal histories of diaspora communities around the world; stories that are often neglected from our history textbooks. This is one reason that I’m so interested and excited by the grassroots stories shared by the NSR contributors from around the globe.